I made a whip!!! And it cracks!!! I’m so excited. There are a lot of things wrong with it, but it’s my first and I will be able to do better next time around. I already have plans of how to change the design. 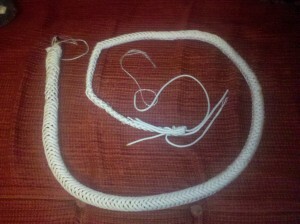 I need to tweak various things so I can work up to building a kevlar fire whip. I’ll be practicing with nylon for a bit because kevlar is almost 6 times as expensive and you need a LOT to make a whip. Anyway I’m totally excited about whip making and actually making a whip that cracks is a really exciting first step.